As always and it will remain in such a way: human medicine is the trendsetter for the veterinary medicine. Many of their innovations attains with delay inevitably also for the veterinary surgeons meaning. Already a trend for a long time continuous in both medicine worlds is certainly those meaning of the diagnostics increasing further. Thereby visual diagnostic technics become the focus of attention in the last years, but , in addition, the progress of the laboratory opportunities should not be underestimated. Hardly any other diagnostic tool is so indispensably and hardly one is handled so different. 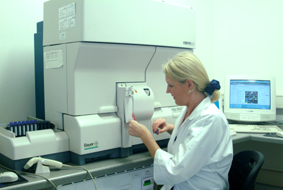 Country wide an amazing number of laboratories is available to the veterinary surgeon. Some large supraregional and some small in the proximity. 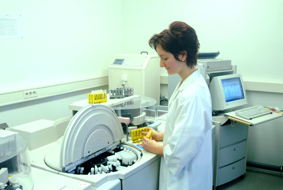 Many veterinary surgeons work with purely human laboratories. They are used for the most usual investigations, because they are fast and cheap. is there somewhat particularly tricky, with LABOKLIN you are on the safe side. The lab in Bad Kissingen was the first one in Germany, which is specialized exclusively in veterinary questions. Around 100 people work for LABOKLIN , including 14 veterinary surgeons and five specialised biologist and chemists. They are responsible for more than 300 000 samples send to LABOKLIN a year !! !